Why have an Eastern Facial treatment at Therapy House? Eastern Facial Massage at Therapy House is the ideal treatment if you want to improve your complexion, reduce puffiness and sagging, tone your skin and improve the appearance of fine lines, and generally relax and unwind. The Eastern Facial Massage is a fusion of Indian Head Massage and Japanese face massage techniques. It can also help to relieve stress headaches, eye strain and insomnia. Many people also choose this treatment because it aids lymphatic circulation and stimulates cellular activity, meaning that the benefits of the massage continue long after each session. 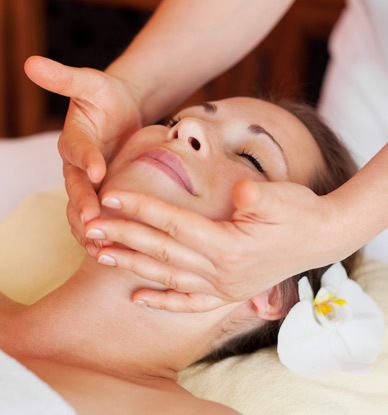 What is an Eastern Facial Massage? Blending the ‘natural facelift’ techniques of Indian face massage with Japanese face massage, this treatment uses refined, gentle massage to work the skin and deep facial tissues in order to improve the complexion. How does Eastern Facial Massage work? During your treatment, your therapist will use a sequence of simple massage techniques and acupressure points to gradually work the skin and muscles of your face and head. What are the benefits of Eastern Facial Massage? Regular Eastern Facial Massage treatments can help to smooth away static wrinkles and expression lines such as crow’s feet. This technique is also fantastic for giving your complexion a boost, toning the skin and reducing puffiness. Thanks to the calming nature of this treatment, as well as its focus on acupressure points, many people find it helpful for alleviating the symptoms of stress, such as headaches and insomnia. Eastern Facial Massage has also been shown to aid circulation and lymphatic drainage, which supports healthier cell activity and better long-term skin health. Your Eastern Facial Massage appointment will last for approximately one hour. Although a single treatment can help to give your skin a healthy glow, the positive effects of Eastern Facial Massage are cumulative, which is why you may decide to make this treatment a regular fixture on your calendar, even if it’s just once a month. Ideally, we would recommend a course of six to eight treatments (one per week) to give you the optimal results, but every case is different and we will always focus on your individual needs. Want to know more about an Eastern Facial?